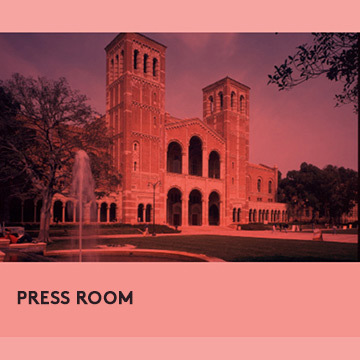 Welcome to CAP UCLA’s online press room, where journalists can find information about our organization and all season programming. CAP supports the creation, presentation and critical dialogues vital to the ongoing innovation and expressive potential of artists in all performance disciplines—theater, dance, music and spoken word, as well as emerging platforms. Press Releases The latest news about upcoming CAP UCLA performances. Press Image Library Images to accompany articles about CAP UCLA season artists and events are available in our press image library. About CAP UCLA Information on the mission of CAP UCLA. About Kristy Edmunds, Artistic and Executive Director. Below you will find links to recent feature articles and reviews. After spending years behind the scenes as an artistic and executive director of various arts organizations, Kristy Edmunds will take center stage on March 25 in Chicago to receive the inaugural Berresford Prize from United States Artists. What the audience experienced at Royce Hall was the crux of what fine art can represent. Presented by the Center for the Art of Performance at UCLA on Saturday night at Royce Hall, “Cellular Songs” is an intimate, lovely work inspired by the complex biological processes of cells. Co-presented by the Center for the Art of Performance at UCLA and Glorya Kaufman Presents Dance at the Music Center, “The Great Tamer” emptied a lot of audience expectations about dance and theater to depict the pointless processes and shallow pleasures in our lives, along with our destruction of the environment and our unwillingness to face the consequences of our choices. Presented by Center for the Art of Performance at UCLA, this hybrid conversation-concert will draw audiences into the music and creative processes of Norman and Shaw, with wild Up performing demonstrations and excerpts and Sirota acting as musical sherpa and host. “Holiday Sauce” was imbued with such freewheeling love and generosity that it tapped into the true spirit of the season. Taylor Mac’s “Holiday Sauce” is a giant, queer-Christmas tour de force that celebrates the holidays in their fabulous dysfunction with re-imagined renditions of 12 musty and tired songs listeners love to hate. "It’s as magical an amalgamation as you can imagine." Sweet Honey in the Rock is middle-aged, gifted and black—and they are the best ambassadors of good will we have: the all-female gospel quartet who suddenly and almost magically appeared on an empty Royce Hall stage last night. At Royce Hall, she didn't sound like someone who should be singing "It's All Over Now, Baby Blue" in anything but the figurative sense. At 74, Germaine Acogny, the Paris-based, Sénégalese matriarch of contemporary African dance, still has the power to astonish.